The beauty of the lotus flower is otherworldly. Maybe that’s the reason so many gods have been depicted atop this lily type water flower throughout the ages. The Egyptians depicted Horus’s four sons standing upon a lotus. Many gods from Hinduism are also shown to be standing on, and holding lotus flowers. Even the Buddha has been known to be standing on, or coming out of a lotus. Each culture that uses the lotus flower in it’s spiritual symbolism does have their own lotus flower meaning, but it also shares a common thread: resurrection. The ancients observed the lotus bud emerging from the muddy, dark and murky water unblemished each morning. At the day’s end the beautiful flower closes it’s pedals and recedes into the darkness of the water, only to be reborn again the next day as a fresh bloom in the morning light. In ancient Egypt, the lotus was a symbol of the goddess Isis, probably for it’s staggering beauty. They said she was born of the Lotus. Also the Egyptians related the life cycle of the lotus with the rising and the setting of the sun. The sacred blue water lily was considered by them a lotus flower, and was used as an intoxicating, spiritual drink which can still be made today. The lotus is portrayed in Hindu art perhaps more than in any other culture. Their gods are commonly seen standing on lotus flowers, and holding them in their hands. The followers of Hinduism attribute use the lotus as a symbol of beauty, fertility, prosperity, spirituality and eternity. It also represents the spirit becoming enlightened, something that is a shared concept of Buddhism. Buddhism favors a detachment from the physical world so as to become more spiritually enlightened. Followers walk what is known as the eight fold path, represented as the eight pedals of the purple lotus. The lotus bud rises from the muck and grime of it’s surroundings to emerge unblemished as a beautiful flower, despite it’s surroundings and humble beginning. The unfolding of the pedals represents enlightenment radiating out into the universe. The Buddhists have given each color of lotus flower a different meaning. Blue stands for spirituality overcoming knowledge and wisdom. The white lotus represents spiritual purity and perfection of mind and spirit. 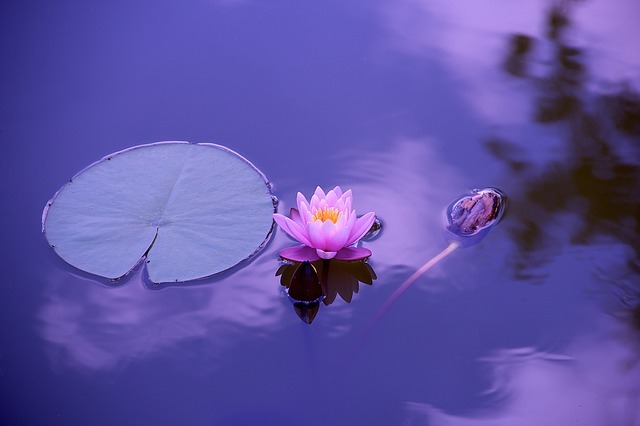 The purple lotus is for secrecy, and the eight fold path. The pink Lotus is considered the supreme one and is associated with Buddha. The red Lotus has to do with the heart, and matters of love and passion. How the Lotus Flower came to be a spiritual symbol for so many different faiths in many different places remains a mystery. But the beauty of this distinguished flower speaks for itself. For whatever reason you chose, the lotus is a special flower indeed.